I enjoy exploring the byways and obscure corners of music, the (now) neglected “minor” masters – those seen today as minor, and all but shrouded in the huge shadow cast by those selected by posterity as giants of their days, although they may have enjoyed great fame in their time. Other, of course, than the minor (or, occasionally, major) pleasures offered by their music, one of the reasons for to explore these composers is to get a better understanding of the terrain in which the giants grew (for the classical era, obviously, Haydn and Mozart), and possibly a better grasp of what sets them apart as “giants”, opposed to the throngs of “minor masters”. Some of these – in the classical era, Boccherini, Dittersdorf, Cambini, the Bach sons, Stamitz, Vanhal, Michael Haydn among others – where indeed highly regarded in their time – and nonetheless, their aura rapidly declined, while Haydn’s and Mozart’s durably lasted. 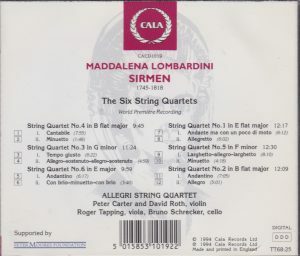 But talk about Maddalena Lombardini Sirmen! Even I had never heard of her, I chanced on this CD while compiling the discography of the label, Cala, otherwise mainly devoted, in the 1990s, to the (always interesting) recordings of its owner, conductor Geoffrey Simon, and reissues of Stokowski recordings in association with the Stokowski Society of London (link will open a new tab to Cala’s Stokowski page). Her birth year, 1745, makes her a contemporary of Carl Stamitz and a near-contemporary of Dittersdorf, Vanhal, Boccherini, Cambini, Kozeluch, Cimarosa; it also places her midway between Haydn (born 1732) and Mozart (1756). Dying in 1818, she outlived them all too (except possibly for Cambini, whose passing isn’t recorded with certainty, but could have been as late as 1825). The disc’s liner notes are a model of information about what is known of her and read like a novel. Born in Venice, she was a violin pupil of Tartini and considered the legatee and champion of his style of violin playing (the long letter sent to her by Tartini in 1760 was eventually published and translated and became the classic textbook in mid-18th century violin playing technique. It can be read online here). She was in fact very famous for a while, and her fame (and travels) extended to Paris and London in the late 1760s and early 1770s. Then this violin virtuoso… switched to singing, and must have been equally good at it, since she was hired as prima donna by the Dresden opera, then in Saint Petersburg in the 1780s. When she returned to Paris in 1785, again as a violinist, she didn’t meet the same success as the first time around: playing styles, fashions and tastes had changed, the Tourte bow had been invented which allowed for more forceful and fast playing, as opposed to the sweet and vocal playing style advocated by Tartini – from which one may derive a fascinating inference, that all the violinists who play Tartini today, even the “historically-informed”, are probably entirely misconceived in their playing style: but thtat’s another story… Anyway, she didn’t change her style, returned to Italy and recessed in obscurity, then oblivion. In her touring days as a violinist, her display pieces, other than Tartini’s concertos, were her own violin concertos or double concertos which she played with her husband (from whom she gets her name, Sirmen). A testimony of her European fame is that Leopold Mozart took part in the pickup orchestra that played one of these concertos in 1778 in Salzburg, under the direction and solo-playing of Count Czernin (Archbishop Colloredo’s nephew and one of the great patrons of Wolfgang). A testimony of her talent is that Leopold described it to Wolfgang as “beautifully written”. Her quartets are among the few pieces of hers that were published – first in Paris in 1769, which makes them contemporary with Haydn’s opus 9 Quartets. The liner notes insist that when they were composed, there was hardly any tradition of string quartet composing and playing: in fact, Haydn’s opus 9 is considered to have established the genre and form, and Boccherini boasted that he, with three pupils of Tartini, had given the first ever string quartet concert, in Milan, in 1765. For the anecdote, for unknown reasons Sirmen’s Quartets were published under her and her husband’s name (and more precisely: “Lodovico e Madelena Laura Syrmen”), although it is assured that she alone authored them. Incidentally, while in Paris, Sirmen was mentioned in various contemporary reviews under the most varied typographies, like Surmen or Sireman. The score of the quartets hasn’t been uploaded on the International Music Score Library Project (a pity! ), and only viola part can be found online on the website of Bibliothèque Nationale de France: horrendously frustrating! A curio is that it bears the opus number III (a detail that appears nowhere on the CD). But there are also 6 Violin Concertos of Sirmen (available on IMSLP), published in London by William Napier, that bear the same opus number. Formally, Sirmen’s quartets follow ancient models: they are all couched in a 2-movement architecture, with a rudimentary sonata form in the first movement, and, usually, a Menuetto with contrasting trio in the second. In the 4th Quartet (track 2), that second movement ends almost before it began. The form is somewhat more elaborate in the second movement of the third Quartet (track 4), a rondo alternating Menuetto-trio and quasi-Adagio, reminiscent of the Menuettos I & II of the baroque era. The second movement of Quartets Nos. 1 & 2 are, so far as I can recognize, built in sonata form, with “exposition” and “development” each repeated. The Finale of the Second Quartet (track 12) and the outer sections of the Menuetto-Finale of String Quartet No. 6 (track 6) and 2 (track 12) are those that truly sound like a Finale in the classical sense, light and zipping, as opposed to the more robust and square gait of the other Menuettos. On the other hand, it is especially in the case of the 5th Quartet that I felt that a Finale was really amiss! But still, I find this very freedom of form (compared to the formal strictures of the classical and early romantic era) quite refreshing. Expressively the Quartets are written mostly in the charming and galant style of Haydn’s early quartets, but they are never formulaic, always affording small surprises, and with streaks and whiffs that plunge into more emotionally tormented, pre-romantic atmospheres (as in the first movement of Quartet No. 4, track 1 at 3:30 and again 5:57, or the trio of the Menuetto, track 2 at 0:38, the first movement of Quartet No. 3 track 3 at 3:50, or again the first movement of String Quartet No. 2, track 11 at 3:35). But in their robustness and drive, the First and Fifth Quartets go beyond the simple galant, salon-style. Some of those first movements contain aspects and moods that would have been in situation in the Andante of a Quartet written in true “classical style”, as in the Third Quartet (track 3 – the actual indication is “tempo giusto”, whatever that means) or the Sixth Quartet (track 5 and indeed an “Andantino”). It is true also with the contrasting trio of Stirng Quartet No. 6 (track 6). The Fifth Quartet begins AND closes with a beautiful, inward Adagio, quite an original touch. The liner notes conclude that “the efforts of this 19- to 20-year-old composer can fairly be ranked with those of the early Haydn and Mozart”, and I fully agree. But ultimately, as always with those composers now considered “minor”, I end up not concerned too much with a comparison with the great giants and trying to recognize what sets them apart and makes them the giants they are, as simply enjoying the pleasures offered by the music as it is. TT 78 minutes, fine recording, committed performers. 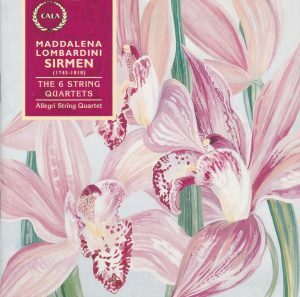 See my Sirmen composer entry for more indications on her current – and scanty – discography.